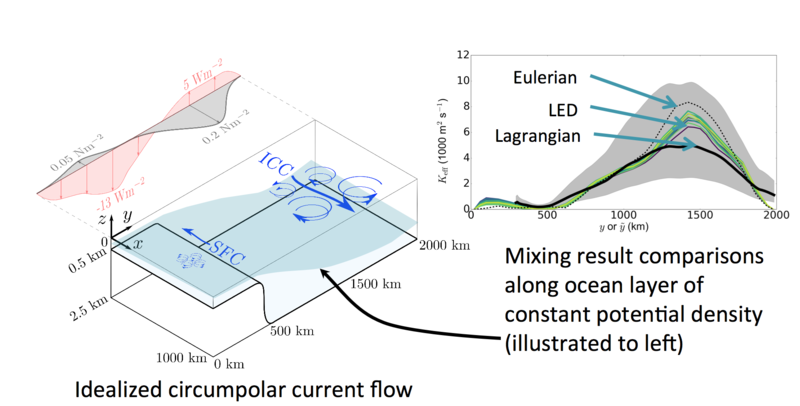 Left panel: The Idealized Circumpolar Current (ICC) and Slope Front Current (SFC) are schematically shown for the ICC simulation. Forcing is zonally constant but meridionally varies. Surface heating is depicted in red and surface wind forcing in gray. Bathymetry is shaded in light blue. Right panel:Comparison of Lagrangian effective diffusivity (LED) calculation techniques for the potential density surface indicated by the dark blue line in the panel. The dashed black line corresponds to effective diffusivity results obtained using Eulerian scalar transport. The solid black line corresponds to cluster-based diffusivity (κyy) (Wolfram and Ringler, 2017) and the gray shaded area spans 1/2κyy to 2κyy. Some complex fluid-flow diagnostics are particularly challenging to capture after a simulation from standard outputs. A novel Lagrangian Effective Diffusivity (LED) diagnostic is developed that provides information on mixing that was previously challenging to derive. Results also imply that particle-based advection and diffusion methods can be used to perform offline tracer studies. LED shows the time-history of mixing evolution, paving way for improved subgrid parameterization. The study verifies and validates consistency of various related metrics to understand eddy mixing diagnostics for eddy-induced mixing. Transport of heat and carbon into the ocean from the atmosphere and melting of ice sheets by ocean flows is largely mediated by ocean mixing, quantified with a diffusivity. Several methods to compute diffusivity exist; however, they differ in their ability to quantify different aspects of mixing. Fundamentally, approaches differ based on frame of reference. If we consider a single, unmoving point in the flow we are in the Eulerian frame of reference. In complement, a frame of reference that moves with the flow is termed Lagrangian. DOE-funded researchers compared two Lagrangian-based approaches derived via the unique Lagrangian In-situ Global High-performance particle Tracking (LIGHT) capability in Model for Prediction Across Scales Ocean (MPAS-O) with a more traditional Eulerian approach that uses standard model output. For example, LIGHT and Eulerian data are used to compute an effective diffusivity that directly measures irreversible mixing by eddies in contrast to the simpler particle-based diffusivity metric that is not designed with this capability in mind. All methods are found to give comparable results, validating the unity of existing metrics to measure mixing. A side-benefit of the novel computational techniques presented in this work is that Lagrangian model data can be transformed for direct comparison to the Eulerian, which opens up many doors for future scientific exploration. 2017. "Computing Eddy-Driven Effective Diffusivity Using Lagrangian Particles." doi:10.1016/j.ocemod.2017.08.008.